Can you believe it’s October! 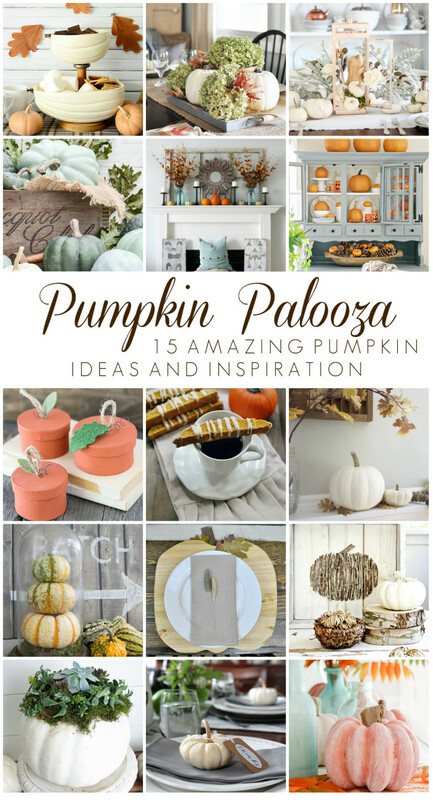 I’m truly excited to share with you the first annual Pumpkin Palooza! Woot! Woot! 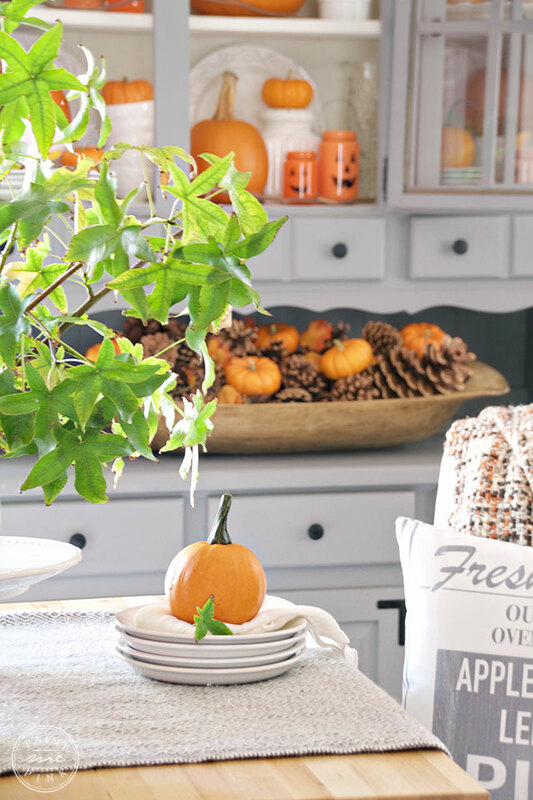 Myself and 14 blogging friends are teaming up with Country Living Magazine to share some of the most amazing pumpkin creations ever! Hosted by the sweet Michelle from Dandelion Patina and Ashley from Cherished Bliss. A week ago, I received some news from my husband letting me know that it was time for us to pack and move again… military life is bittersweet, it’s rewarding but you make sacrifices. At first I was a bit upset knowing that we were going to have to move the kids again and have them start new schools and the list of sadness went on. Sometimes it’s hard to look at the bright side when you are thrown a curve ball when least expected, but we’ll get through it. Even though we’ll be moving in a matter of weeks, it won’t stop me from crafting and decorating our existing home one last time with pumpkins. 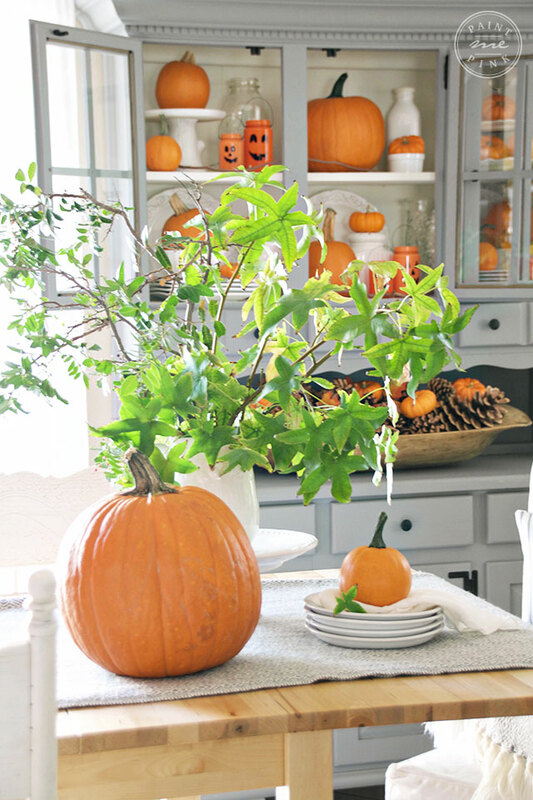 Every year I want to decorate with pretty white pumpkins but as soon as I see the orange it’s all over and I can’t walk away from them. 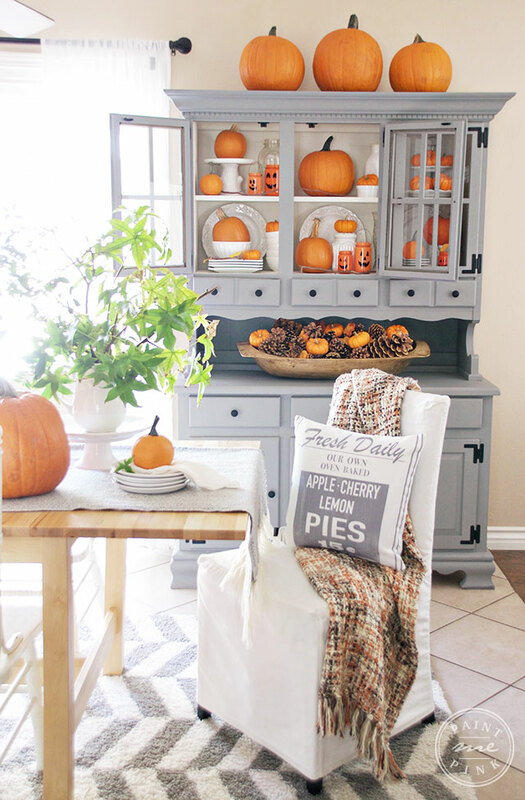 I just love the traditional rustic look that they bring and Fall wouldn’t be the same if we didn’t have them in our home. Plus my three little ones absolutely love them as well. 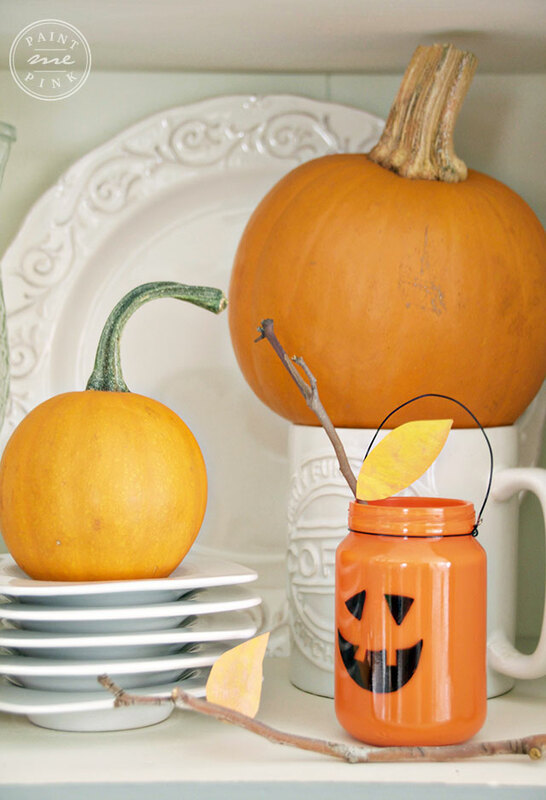 I wanted to create a new DIY pumpkin craft because it’s always fun to create something that’s never been done before. 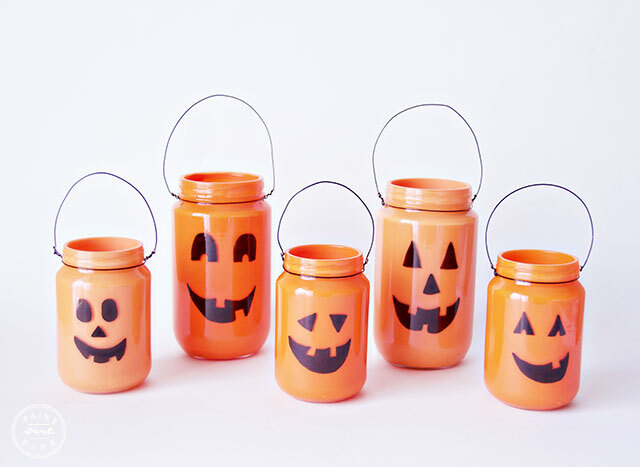 However when I stumbled upon Martha Stewart’s Jar-o’-Lanterns I knew that I had to make them! This may not be a brand new jar craft but I was inspired to create and make something fun for my kids. It’s not always about creating something new and exciting, it’s also about being inspired by what’s already been created. 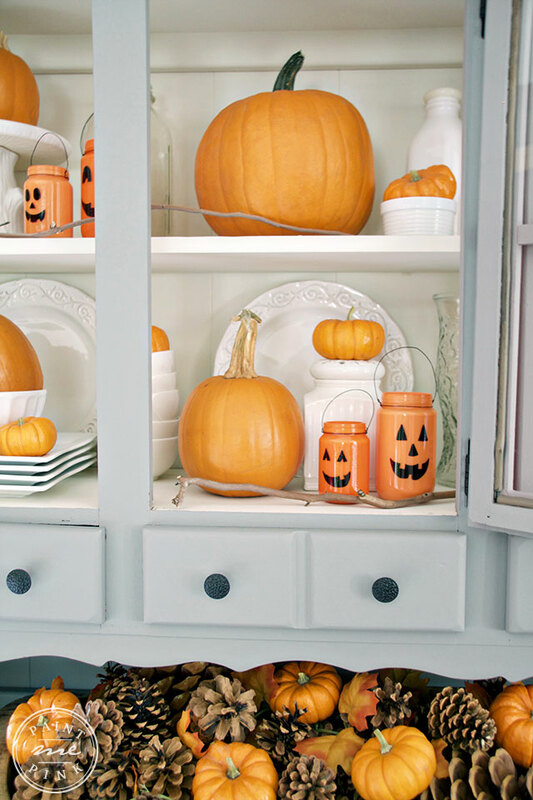 These Jack-o-Lantern Jars are the perfect addition to our hutch and they compliment our bright orange pumpkins. 1. Thoroughly wash each glass jar use your Goo Gone (or similar product) to remove the sticky label from the jar. Dry jars with paper towels. 2. In a small cup or bowl mix your paint with a small amount of water until well blended.. Note: Don’t water down the paint too much or it will look clear-ish and runny on your jar. 3. Pour paint mixture into the empty jar. 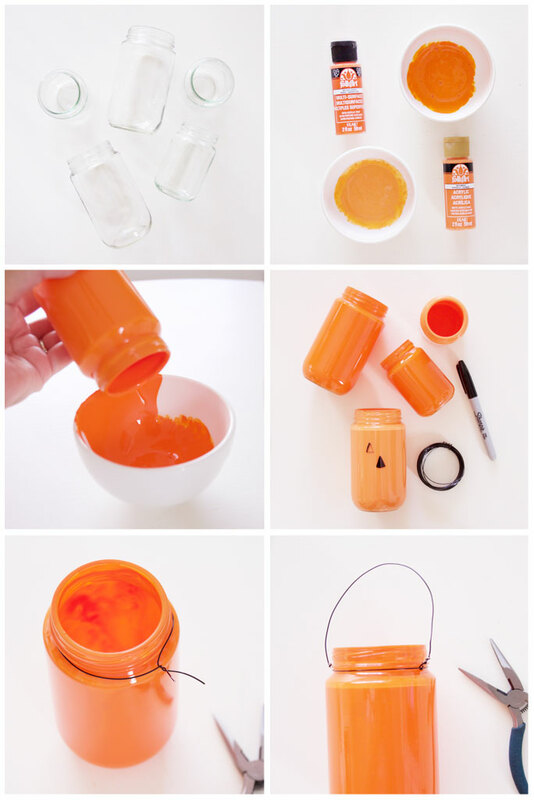 Roll the jar around until the paint has completely covered the inside of the jar. 4. Pour the excess paint back into your bowl. Note: Use a wet paper towel to wipe off any paint that may have dripped onto the outside of the jar. 5. Allow your jars to dry completely. 6. 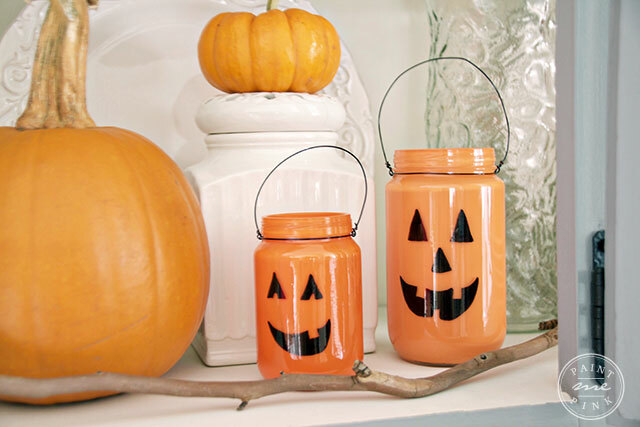 Once jars are dry, use the black sharpie to draw your jack-o-lantern faces. 4. Use your wire cutters to cut a piece of wire that will fit around the neck of the jar, plus a few extra inches so that you can twist the ends together. 5. Cut another piece of wire long enough for a handle, plus an extra 1/2 inch on each end. Slide each end through the wire against the neck of the jar and fold up. Then twist the rest around the handle part of the wire. Use pliers to get it twisted nice and tight, trim off the excess wire, and bend the ends toward the jar. 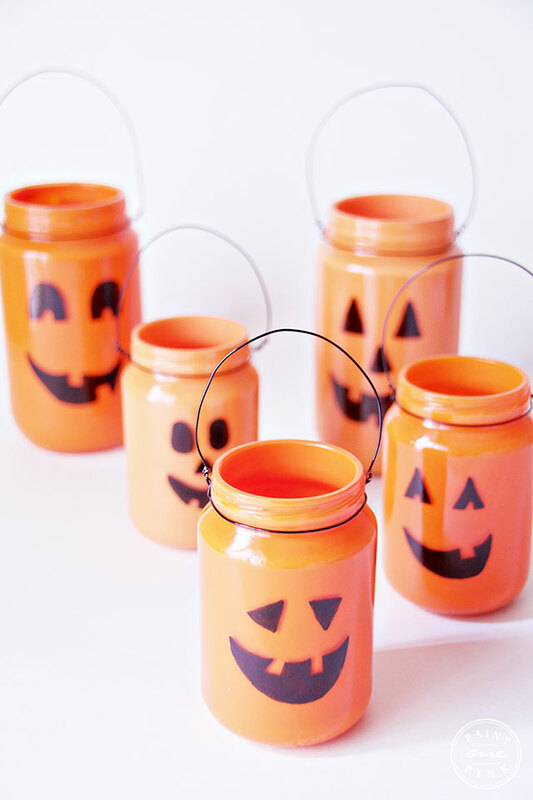 You will love making these jack-o-lantern jars! I hope this inspires you to create something pumpkiny! You can also join in on the pumpkin fun on Instagram by using the hashtag #octoberpumpkinpalooza to share your amazing pumpkin creations! 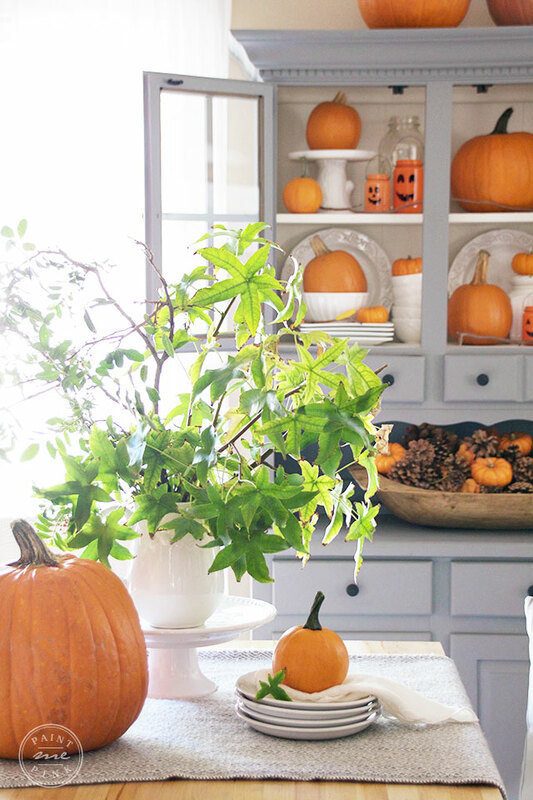 Take a little time and visit these amazing gals for more Pumpkin inspirations! AMAZING! Your photography is jaw dropping. Thank you so much for participating in Pumpkin Palooza with us. Your project is so adorable. These are so cute! 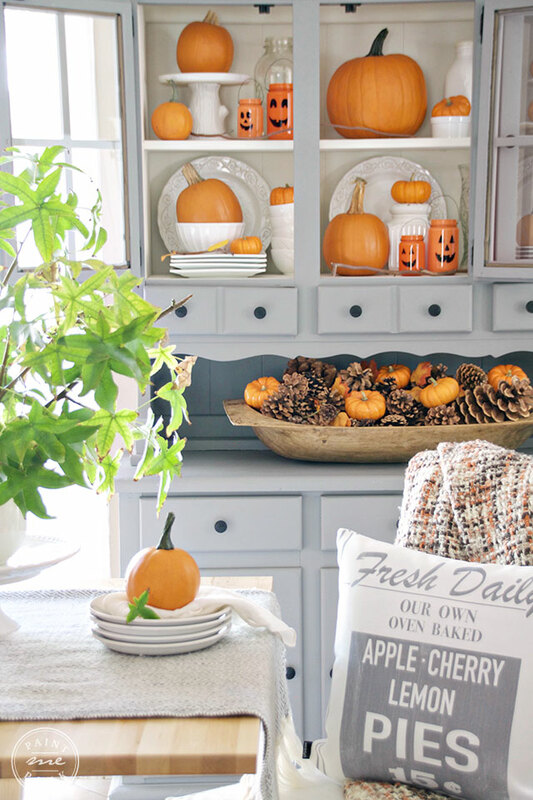 I love how you have everything displayed with the white dishes and pumpkins in your cupboard. Thank you so much, Kelly! I had a fun time decorating and making jack-o-lantern jars 😀 and thank you for such a lovely comment! Have a beautiful day sweetie! Wow! This whole set up is absolutely lovely! So excited to get to know you and your blog better – and I would have a super hard time being asked to move at the drop of a hat. Best of luck to you! 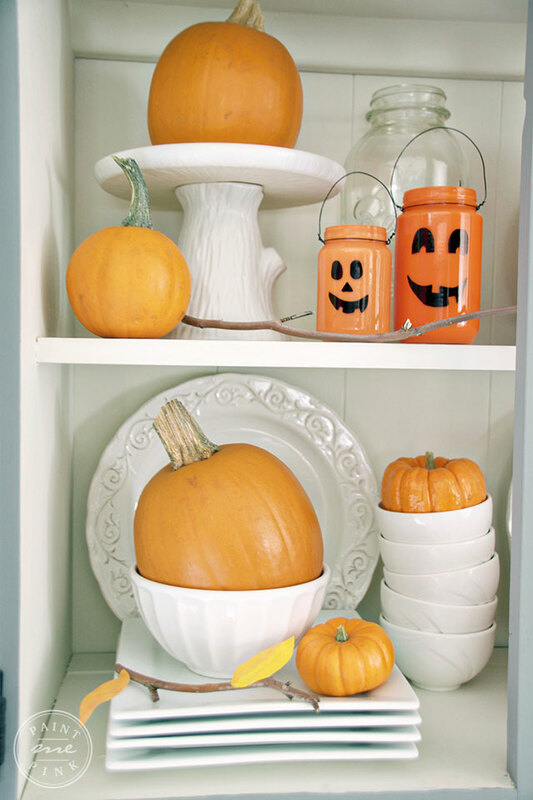 Your jar are adorable and look so good styled in your hutch with all of the other pumpkins and white dishes. I went with all white pumpkins this year and now you’ve got me rethinking that 🙂 The orange looks awesome in your gorgeous space! 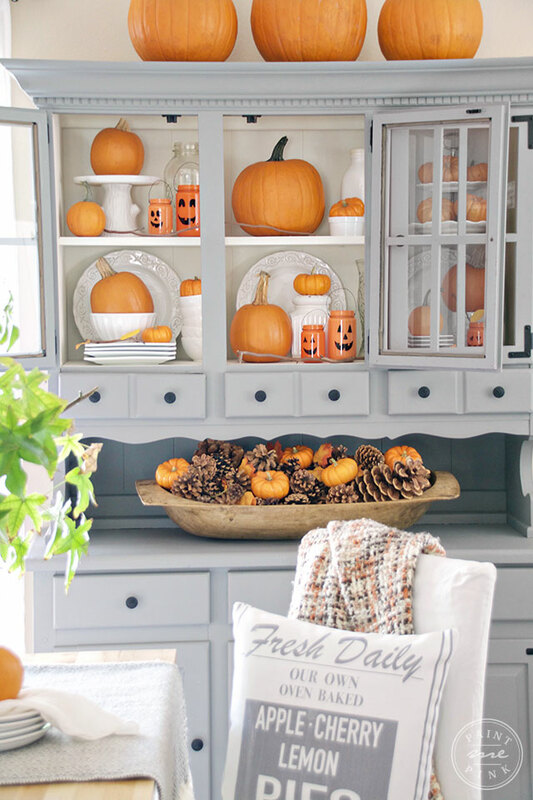 I love the pumpkins and all that orange against the gray! Super cute!!! 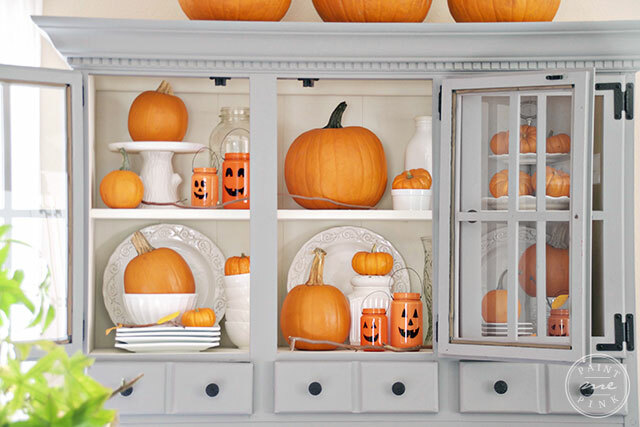 I love all the orange – and the jack-o-lantern jars work so well in your hutch. It’s a beautiful display!! Thank you, Tonya!! I wasn’t sure what I was going to do with the hutch but I’m so glad everything came together at the end 🙂 I would have made more jack-o-lanterns if I had more jars hehehe Have a wonderful day sweetie! These are so adorable and fun! Love them displayed in your gorgeous hutch! 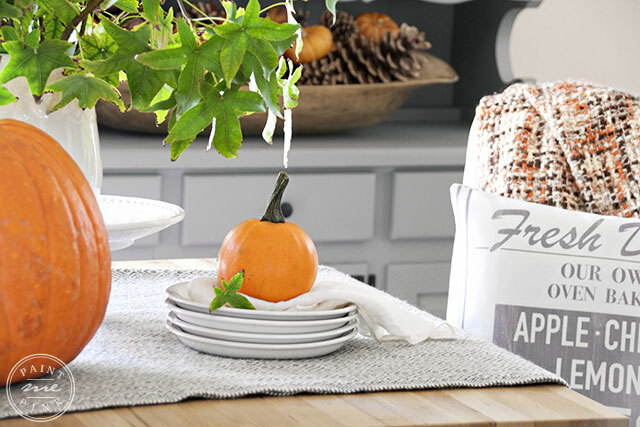 Your room looks so cozy for Fall! So adorable! 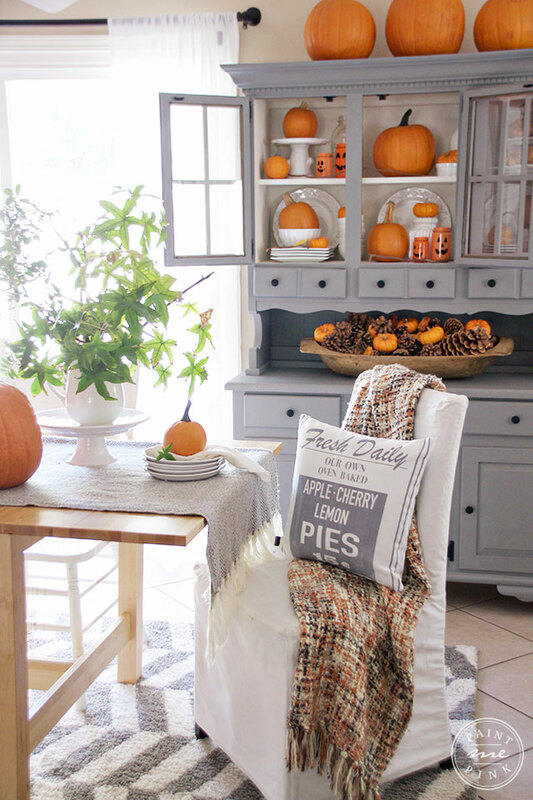 Love the jack-o-lanterns, pumpkins, and hey your beautiful pillow! 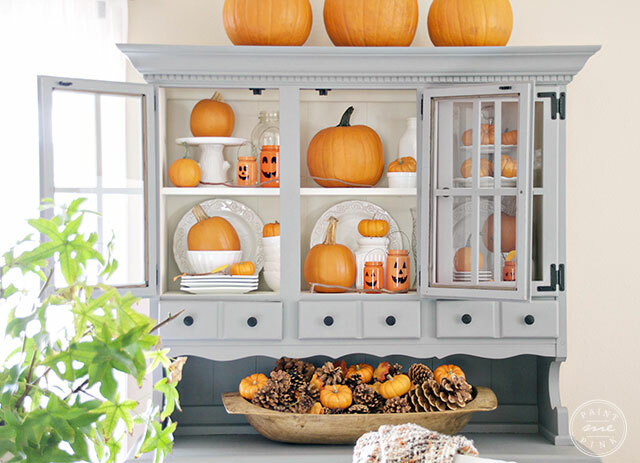 This is my first time to visit I think …..anyway your grey cabinet with all that white and orange just made my heart sing. 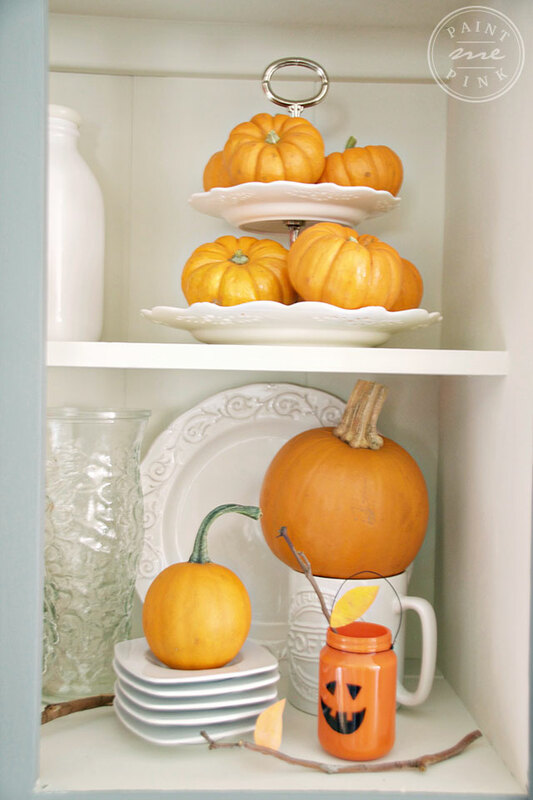 arranging things……….really your cabinet, white dishes and all that orange and all your photos are simply stunning. Thanks for sharing ……this brighten up my day. Norma those are so darling!! And somehow you managed to take this cute craft and blend it into an absolutely gorgeous environment and they blend seamlessly. It’s all beautiful! Ahhh! 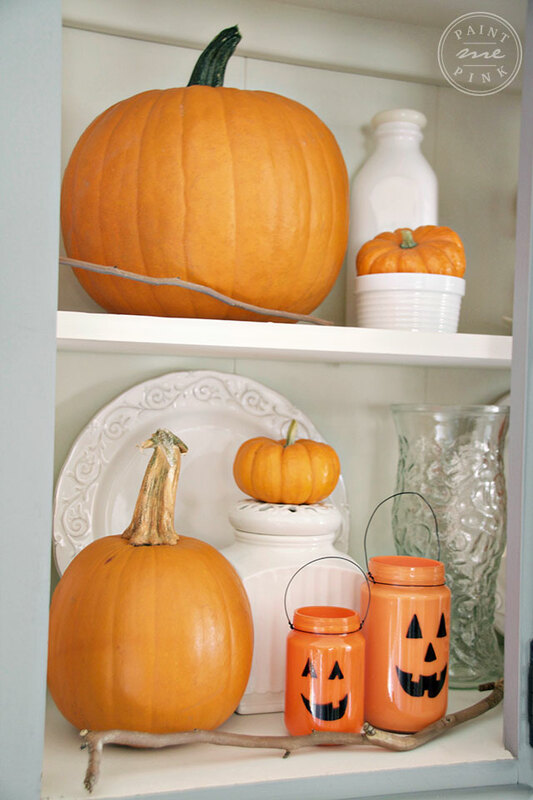 I need more pumpkins in my life! And also a hutch in this exact color. LOVE your styling, Norma! Those jars are just adorable. I was seriously swooning over this entire post! You nailed it girlfriend! 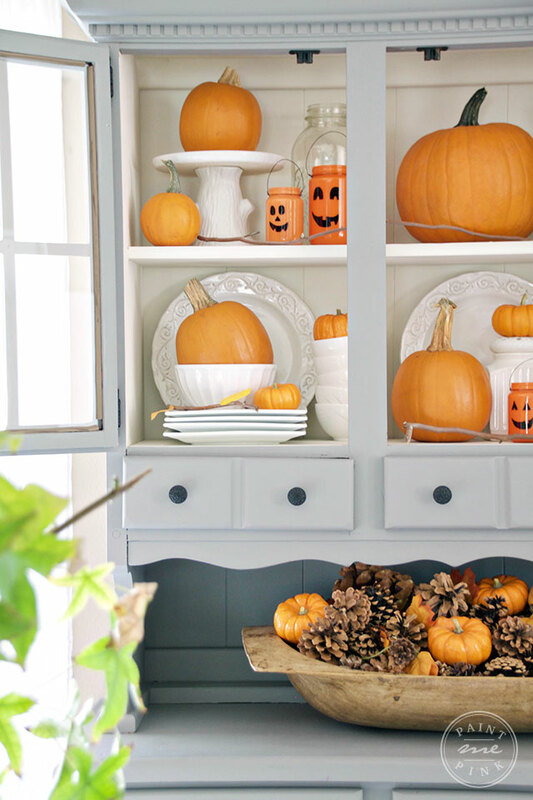 I just love all of the pumpkins and adorable little jars!!! What a fun, crafty project! So fun working with you on this blog hop! 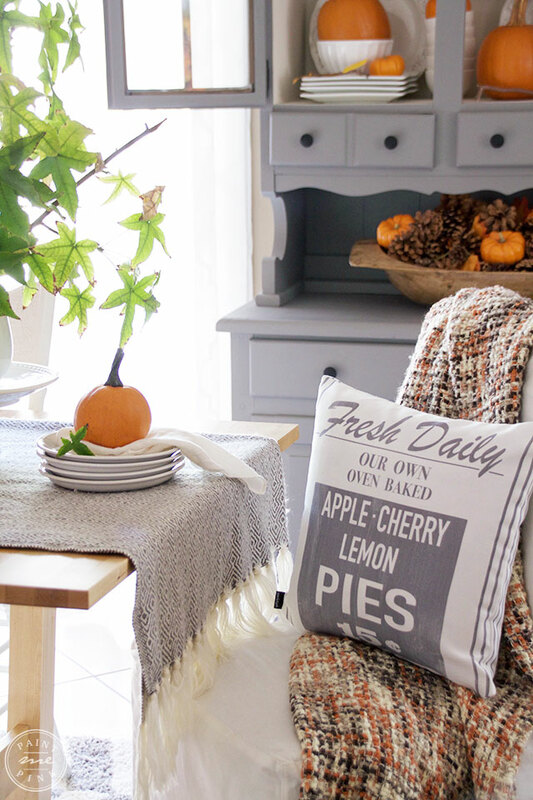 Love the pumpkins, but I am totally stuck on the pie pillow. Where did you find it? Hi Cori! So glad you like my hutch 🙂 I found this hutch on craigslist for $40! and the paint color I used is called Annominous by Behr paint. Thanks so much for stopping by!